At one time or another over the years, I confess I have done most of those things. On my better days, I have had enough compassion to suspend the questions or judgment and simply give a little help. At other times the questions or doubts have won out and I have looked or walked the other way. Sometimes I have even felt afraid, not because the homeless person was menacing (which seldom happens), but because the situation was strange to me and beyond my comfort zone. I have personally witnessed homelessness in at least four cities; Toronto, New York, Miami, and even my lovely San Diego, in each case with people literally sleeping on the sidewalk. I must tell you that, of all of those, Toronto in January felt the most desperate with the mercury plummeting to dangerous levels on bitterly cold winter nights. In all the times I have encountered homelessness and street begging, one thing I have never done, and probably never even considered, is to take the time to make the acquaintance of the street person and get to know them. But that is exactly the strategy of Toronto street worker, Tim Huff as described in his 2008 book Bent Hope: A Street Journal published by Castle Quay Books. Huff invests the hours, days, weeks, and often months it frequently takes before the person is able to trust him enough to let him in. The experiences chronicled in this little book provide a brief glimpse into Huff’s daily encounters with the homeless. The author works with youth, so most of those he introduces us to are young; often in their mid-teens. It is both enlightening and chilling to learn exactly what their former life was like that made this desperate and dangerous existence preferable. One might expect stories of homelessness to be depressing. While it is true that many of the stories do not have a happy ending, the overall impression one receives from reading this little book is one of hope; albeit a hope that is often "bent" just as the title implies. 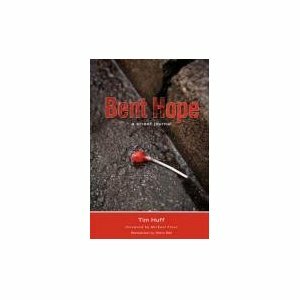 Yet hope is real, and sometimes Huff’s nights of listening and talking result in new beginnings and lives saved. I encourage you to find and read this little book, available here from Amazon. It will warm your heart and bring you hope. What's more, you will never look at homeless people the same again. In 2003 I lost my job. It was shortly after a 3 week layoff for reserves were tapped.I found a job, shortly after coming home to eviction papers on my front door. I probably never would have been homeless. I have family, friends etc.But the experience taught me how fast it can happen to "normal" people. The term "There but for the grace of God" seems appropriate here. Thanks for sharing your experience Steve. It can and does happen to so "normal" people. Still, and certainly not to over simplify, Tim Huff suggests that the majority of people who are living on the street are there because of problems such as abuse and addictions among other reasons. In my view, there is a problem with the expression, "there but for the grace of God go I." The unintended inference is that God's grace was with speaker, but not with the person spoken about. I am sure you did not intend to suggest that.